“A man builds a fine house; and now he has a master, and a task for life…” Are you, as an El Dorado Hills homeowner, haunted by Ralph Waldo Emerson’s words? If you are worrying over the need for a shingle roof repair, consider these five facts, rest easy, and put Emerson back on the shelf. Asphalt-fiberglass shingles are tough, wear well, and are made to exacting standards; a manufacturer’s warranty will probably not apply to repairs. Ask about the contractor’s workmanship warranty; Straight Line Construction trains and warrants our workers. Shingle roof repair may or may not be covered under your homeowner policy, depending on the scope of the damage and the age of the bottom layer of your roof. For example, an old or weather-worn roof will not trigger a claim; a falling tree will. By hiring a professional firm like Straight Line Construction you leave the insurance worries to us; we carry $4 million in liability insurance, plus all other coverages. 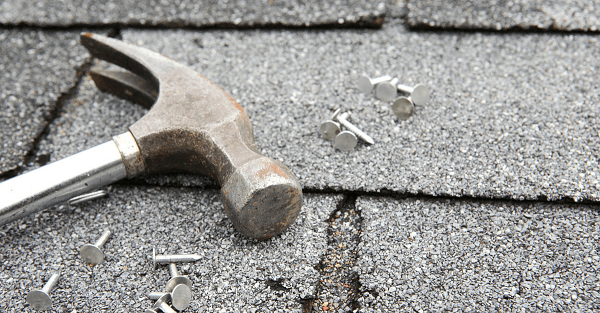 Place your shingle roof repair in the hands of a local contractor with strong community ties. Can you trust someone who “was just helping a neighbor and can help you too, while in the area?” This door-to-door tactic by disreputable roofers may bring you a low price, but it also brings no peace of mind. Straight Line Roofing knows building codes for El Dorado Hills, and we adhere to local environmental protection ordinances. Straight Line Roofing has been licensed to operate as a contractor in California since 1999, holding CSLB Lic#763434, holds a Contractor’s Bond, and is licensed in 14 classifications, including roofing. Protect yourself; check your contractor to ensure compliance with all state licensing requirements. When a tree limb falls, or a boot flange no longer seals and you get a leak, shingle roof repair is an economical option. Straight Line Construction can make efficient, budget-minded repairs quickly on localized damage as small as one or two shingles. If your shingle roof on your El Dorado Hills home is old, weather-worn and losing granules, repair is probably not the right choice. To maintain your home’s value, consider instead the many benefits of having Straight Line Construction replace your home’s entire roof with new, attractive, long-lasting CertainTeed, GAF or Owens-Corning shingles. Contact us for more information on how our work can benefit your home.